A trio of Hoosiers, Christian Watford, Jordan Hulls and Maurice Creek, participated in the Derby Festival Basketball Classic over the weekend. It was my first in-person look at Creek and the Hargrave Military Academy guard exhibited star potential. Creek absolutely lived up to the billing that he’s one of the top shooters in the 2009 class. In the 3-point shootout and in the shoot around on Thursday, he showed the capability of hitting shots from all angles. He’ll play big minutes early in Bloomington for this reason alone, but he’s much more than a shooter. He can also knock down the pull-up jump shot and get into the lane and finish. He exhibited above average ball handling ability and told reporters that he’s comfortable at either guard position. After the game on Saturday, he commented that he wanted to smile and have fun because some say he’s often too serious. However, his business like approach at times is part of what makes him great. He’s not the type of kid that is going to do much, if any, jersey popping or chest pounding. It was hard to judge him defensively during the game on Saturday, but in Friday’s 2-on-2 contest final, he more than held his own against a quick point guard in Eric Bledsoe. His length and athleticism give him the tools to become an outstanding defensive player. The Bottom Line: It’s hard to imagine a scenario in which Creek’s name won’t be called out in the starting lineup come the season opener next fall. He’s a humble kid who seemed thrilled to be participating in the Derby Festival Classic. His answer to nearly every question he was asked started with getting teammates involved and having fun. His ability to play either guard spot will give the IU coaching staff another ball handling option along with Verdell Jones, Jeremiah Rivers and Hulls. To begin I wanted to let you know that I enjoy the site. I have been a reader for a few months now, but this is my first post. Thanks for all that you guys do. Now onto Mr. Creek. I have not seen him play, and like most of the incoming freshman I wonder what their impact will be next year. In the article this is the first time for me hearing that Creek would be a starter at the beginning of the fall. I was just wondering if you could compare Creek to Devan Dumes for me(or any other player for that matter really)? I was at the game Saturday and feel that Creek will be hard to keep on the bench. I compare him a little to Jordan Crawford. He has size and can shoot but he also finished a few as well. Creek and Waterford will both be in the starting lineup early next year. I've heard (or read, actually) alot of pundits saying that Creek was actually our best prospect in the '09 class & after this weekend's showing, it sounds like they may have been on to something. Not to take away from how great Watford looked this weekend as well – maybe they'll both be program-changers! It's hard to compare him to Dumes. They're totally different players. I feel Creek is going to be a much better player than Dumes. 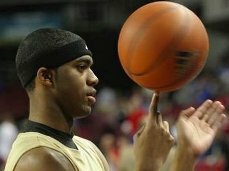 I think a pretty good comparison at the same stage would be E'Twaun Moore of Purdue. If he can continue to improve, I think that's a pretty fair comparison and one that IU fans would be happy with. Do you really consider Jones a primary ball handler at this point? I like the etwan moore comparison. He seems to have a similar build, looking forward to this class…. on hoosier scoop? IU is pursuing Creek's PF teamate, DeShawn Painter. After last year's TOs it worries me to call Jones a “ball handling” option but I know what you mean. I can see Creek getting minutes but it will be difficult for him to start unless he can execute defensively. Watford however is walking into a position where we are weaker so he has a better chance to start, even if his defense is not good. If you look at last year our biggest problem is defense . We desparately need to reduce pts/gm by 9 points. I think we can do this with Rivers via more ball pressure and fewer TO's. Dumes is pretty darn pesky on defense as well. On a unrelated note: I should be seeing (and hopefully taking video of) Matt Carlino, Marshall Plumlee, Spencer Turner and Cody Zeller this weekend. Not a primary ball handler, but he could get a little time at that spot when Hulls and Rivers are out of the game. I wouldn't expect it to be much though. Jerry helluva point……….you are one of my favorite guys on this site, you love the defense…….interesting enough…is during the knight days, IU was known for it's D…I don't think many schools came claim that anymore….maybe Duke…….. Thanks, we all appreciate your comments on this site. Louisville's success this year was heavily based on defense especially ball pressure on the perimeter. They were a low scoring team almost the entire year and when TW was shut off ( ala MSU ) they were weak …………….but only if the other team could handle the ball. The point is to consider how far they went as the #1 seed and BEAST champ heavily reliant on the D.
One of the great things about basketball is that it is easy to see the synergistic effects that can occur on the court. I think you will see both improved scoring and defending next year due to the team's improvement in athleticism and also from having taller players. Improved athleticism means we should be able to get our own shot more often AND defend the perimeter better AND see fewer double teams down low. The better height means we should get more rebounds AND get more points in the paint AND defend the rim more stoutly. Add these things to better ball handling and its clear to me that we should be better. I don't see 20 wins, but I am hoping that we make it to the NIT. Dave…an NIT bid would be huge for this team, just as I think it is and will be huge for Penn State next year if their guys stay…..it is progress for a young team, it is competition in a tourney type setting and your season continues which is what we expect at IU. Is it NCAA, no but for a group of frosh, sophs, and a few upperclassmen it is a good start 'over'….. I was at Freedom Hall Saturday night and I left saying that Creek wasthe better of the 2 players although Watford is nothing to shake a stick at. Both players are exciting to watch and I can promise that both will be in the starting line-up. Watching those 2 dominate a game meant to bring UL and UK recruits to the Ville to play in front of their fans was nothing short of awesome. There were a few of us in the corwd wearing the Crimson and Cream it was dominated by the blue and white. It was nothing short of amazing watching 2 IU boys hand it to their recruits, not to mention the move Hulls put on lightning fast UL recruit Peyton Siva, it was nasty! Who the heck is Waterford????????? You mean Watford. I completely agree with Dave's comment about the better athleticism allowing the Hoosiers to do things more effectively offensively and defensively. This is something the Hoosiers sorely missed this year. With the shot clock running down unathletic, stand and shoot guards had a hard time getting good shots against the increased pressure. Creek, Hulls, and Rivers should all hopefully add greatly to solving this problem. This more athletic and deep team (with the number of minutes logged by people this year that normally wouldn't have played early) should also allow the team to get out and pressure teams and play a more uptempo style that Crean enjoys. Next stop for Isiah: Florida International?